Yet I still see myself as a skateboarder even though I don't actually go out and skate on any kind of regular basis. A combination of trying to find time and wanting to do so many other things along with an almost crippling lack of confidence on a skateboard keeps me away. There is, almost literally, a public skatepark at the end of my street that has been there for more than a year and I've only skated it about 3 times. I even know when the park is most likely to be empty - so I don't have to be the oldest grommet in the park. Learning to skate all over again is frustratingly bad. 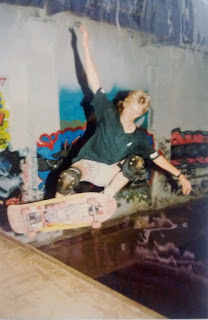 I just can't seem to get my confidence back to try tricks that were, at one time, no more challenging than simply riding the skateboard on flat ground without falling off. However, as a mini-ramp skater I could get by with quite a few moves that would show I didn't just start skating yesterday. Fortunately there are a few photos that show I was a bit good at skating back in the day. Anyhow, now that Australia is heading into Spring. I've dusted off the little quarter pipe ramp I built last year and set it up in the drive way. Hopefully it'll help me get some confidence back if I spend a bit of time skating it every day - well that's the plan. I think I should write more about skateboarding here too. If you follow my Facebook or YouTube channel you may have seen the video below already but if not, enjoy watching me not doing much on the aforementioned quarter pipe shortly after I built it.